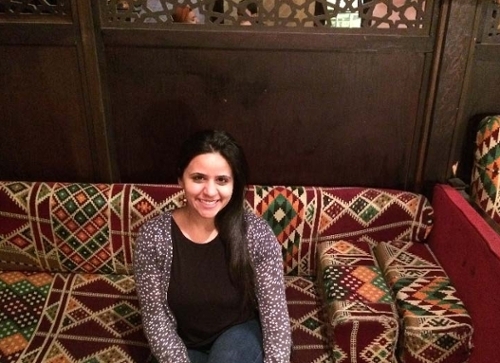 The Faculty of Graduate Studies caught up with Master's of Arts: Peace and Conflict Studies alumna, Heba Abd El Hamid, to hear about her Winnipeg restaurant Arabesque Hookah Cafe and Restaurant. What year did you graduate from the Peace and Conflict Studies program? I defended my thesis in December 2015 and received my diploma in February 2017. What experiences in the Peace and Conflict Studies program prepared you or assisted you in opening the Arabesque Hookah Café and Restaurant? I gained two important skills that are transferable from Peace and Conflict Studies (PACS) to Arabesque. First, with PACS being an interdisplinary field, it forces you to consider not only one side of the debate but the many and often neglected sides. This has taught me to not only think as a business owner, but also to consider the social, psychological, environmental and political consequences, especially when hiring newcomers. Second, PACS strives on empowering people as a whole, and this is of essence in the work that Arabesque does. When we hire our staff, we work as a team and ensure that we are providing valuable life skills and confidence to better our staff's lives, meaning they are independent. One part of that is working as a team. We all do everything together including cooking, cleaning, serving, purchasing. Another part of empowerment is creating a safe space where our staff feel confident in us and our customers to practice their English, and creating dialogue about what life is like for newcomers. Unfortunately we are faced with global circumstances that hold negative stereotypes about the Middle East, Islam and newcomers. We know that creating dialogue around these issues is one of the most important ways to empower people and create sustainable change by creating the opportunity for members of numerous communities to experience a slice of Middle Eastern culture. Did you plan on opening a restaurant after you completed your degree? My business partner, Mohammad Naser, and I have our own list of priorities and passions. Affordable, fresh food, the global context of the Middle East, and newcomer issues were passions we shared in common. Opening Arabesque, a restaurant that allows Middle Eastern culture to strive in Winnipeg, while hiring newcomers and Canadians, and creating dialogue, was the perfect fit. What are you learning now through the restaurant and do you have any plans for future projects? I learn new things at Arabesque every day, which I am grateful for. The component most related to PACS is certainly team working and empowerment. We pride ourselves in working as a team; we make each other stronger every day. Each member brings something unique to the table. We motivate one another to advance in our daily lives, not only at work, but also as people. This starts by knowing our flaws and our limits and by completing tasks together. I am confident this shows in the atmosphere we have created and each dish we serve. As for other projects, keep an eye out for future Arabesque ventures in the near future. And personally, academia in the field of the Middle East and gender studies is something I will continue to pursue. The most important piece of advance I can offer future graduate students is to be open-minded and take opportunities as they come. Graduate school is a difficult and a major milestone to complete. It requires intensive work. When I completed my masters it was different than what I had anticipated going in, for the better. My committee encouraged me and really pushed me to work harder to produce quality work, which would not have been the case if they did not give their advice and skills. I got to travel the world through my masters, including Greece, Turkey and Egypt. I got teaching experience, friendships and an abundance of skills that I would have missed out on if I did not take my committee’s advice when there were easier alternatives. Click here to read more about what our alumni are doing.